Until the 10th century, cleanliness and science are still dormant. Only after the 10th century people began to realize the connection between cleanliness and health. In Europe the manufacture of soap gaining popularity, especially in Italy, Spain, France and Britain. Soap was made from a mixture of olive oil or olive oil with the fragrance of flowers. In the 17th century soap just for rich people because they're expensive. It includes luxury items so that high-taxed in the UK. A half century later, British Prime Minister at the time, Gladstone remove soap tax in order to maintain cleanliness. Sabunpun industry began to grow everywhere. Soap was solid, a big chunk shaped, colored and are fragrant only sold kilogram. New about the 1830s, soap wrapped in small pieces. 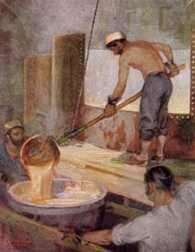 Nicholas Leblanc of France introduced the sodium carbonate or soda ash as an ingredient of soap in the 18th century. Twenty years later, another French scientist created the soap from glycerine and fatty acids. That's the soap precursor chemicals. Industrial Detergent first found in Germany is a mixture of sodium salts, alkyl sulfate and alkyl benzene sodium sulfate. Then more widely used detergent for washing clothes, while the soap used to clean the body. Soap, now the goods are easily available, many forms, there are square, round, liquid and the fragrance can be chosen according to taste. Humans everywhere have a shower with soap! Know, is it not different from that soap?